WASHINGTON, Feb 27 2014 (IPS) - The unexpected resignation of Hazem al-Biblawi, Egypt’s interim prime minister, and his government this week and the appointment of Ibrahim Mehlib, a Mubarak-era industrialist, as a new prime minister seem to pave the way for Field Marshal Abdul Fattah al-Sisi’s anticipated presidential bid. These intriguing government shuffles, however, fail to hide the reality of the military junta’s repression and massive human rights violations. Washington has a huge reservoir of “soft power” in the region, which it could and should use to bring about democratic transitions. The politically motivated indictments, trials, and convictions of regime critics, including journalists, academics, entertainers, comedians, and ideologically diverse political activists have cut across large segments of Egyptian society. The regime’s initial claim that repressive measures were necessary to uproot the Muslim Brotherhood and its supporters and decapitate its leadership is no longer believable. The military junta is determined to live its “fascist moment,” in the words of Professor Augustus Richard Norton of Boston University, and to maintain its grip on power come what may. Sisi doesn’t seem worried about a potential loss of U.S. military or economic aid because he expects Saudi Arabia and Russia to fill the gap. Perhaps the real reason that underpins his lack of concern about losing U.S. aid is the belief that the Obama administration would not certify to Congress that the junta has not made any progress toward democracy. Washington would not want to lose Egypt, which means military aid will continue; hence, no certification. While Sisi presents his leadership style to many Egyptians as a combination of the late President Gamal Abdel Nasser and Russia’s current ruler Vladimir Putin, many in the region and in Washington are asking one key question: Does the Obama administration have the will and credibility to halt Egypt’s deepening dictatorship and promote human rights and freedom of expression? This is a fair question since President Barack Obama has invoked U.S. democratic values in supporting the revolution that toppled Mubarak, in urging the Bahraini regime to engage the opposition in meaningful dialogue, and in calling for an end to the Assad regime in Syria. Additionally, most observers believe the international community cannot act decisively on behalf of human rights in any of these countries without U.S. leadership. I have argued in the past two years in this space and elsewhere that Washington has a huge reservoir of “soft power” in the region, which it could and should use to bring about democratic transitions. Democratiation would reflect U.S. values and serve U.S. interests. Other regional experts advocated a similar approach. The Obama administration has lost much of its credibility in the region, particularly in Egypt. It worked closely with the Mubarak regime and then abandoned him in favour of the revolution in January 2011. Washington supported Mohamed Morsi’s presidency because he was the first ever freely elected president of Egypt. Yet the Obama administration failed to condemn his removal in a military coup led by Sisi. In fact, the administration went through all kinds of rhetorical hoops and gymnastics in order to avoid calling the military coup by its real name — a coup. Washington has also remained silent in the face of ongoing state persecution of journalists and nationally known academics. Some academics have spent time in Washington, D.C. and other U.S. cities in the past three years consulting with U.S. officials about the prospects of democracy in Egypt. Sadly, they are no longer walking in Washington’s halls of power but languishing in Egyptian jails. Several factors could explain Washington’s apparent paralysis when it comes to Egypt. First, according to media reports, much uncertainly seems to characterise the administration’s policy debates on the Middle East but particularly on Egypt. The constant attempt to resolve the Values versus Interests dichotomy has left the national security community within the administration rudderless, creating an impression of impotence, confusion, and a lack of direction. Second, the administration’s vacillation on Syria — whether to pursue a diplomatic or a military solution to the conflict — has rendered the United States a “paper tiger” in the eyes of Arab publics. Most of the world had expected Obama to strike Syria, but instead he took the case to the U.S. Congress with the promise that Syria would destroy its chemical weapons. Syria’s delivery of the weapons for destruction has stalled, and the Geneva talks have failed. The Assad regime was playing for time, and Washington is left holding an empty bag. The statements and rationalisations that Secretary of State John Kerry made in his TV interview with MSNBC’s Andrea Mitchell on Feb. 26 were a pallid display of the administration’s pendulous position on Syria and by extension on Egypt. When Mitchell pushed Kerry about the human tragedy in Syria and the regime’s use of its air force to drop “barrel” bombs on the population, he demurred and said that all options are on the table. The pro-democracy convictions Kerry expressed in the interview in support of the anti-regime uprising in Ukraine were totally absent when he spoke on Syria and other “Arab Spring” countries. Third, Obama’s upcoming visit to Saudi Arabia must have been preceded by intense efforts at appeasing the Saudis and allaying their doubts about U.S. resolve on Syria. 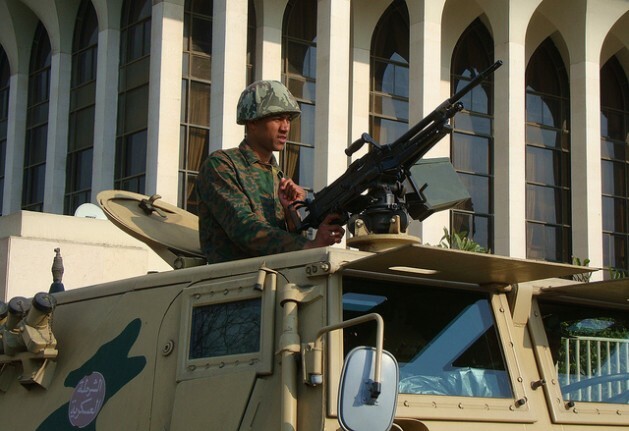 A palatable visit from the Saudi perspective would be for the U.S. president to support the Sisi coup and keep U.S. military aid flowing to the Egyptian military. The Saudis also would urge Obama to ease up on the Al Khalifa regime in Bahrain and be wary of Iran’s perceived charm offensive. The pessimistic assessment of the administration’s policy oscillation could be reversed if Washington compels Syria to ground its air force and if it publicly and unequivocally demands that Sisi chart a clear pathway to democracy. Supporting democracy in Ukraine reflects U.S. values and serves Washington’s national strategic interests. This should be the default position toward Egypt as well. Emile Nakhleh is a former Senior U.S. Intelligence Officer, a Research Professor at the University and author of “A Necessary Engagement: Reinventing America’s Relations with the Muslim World”.